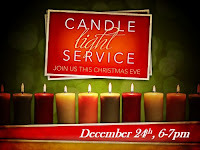 We are looking forward to a great Christmas Eve Service here at CCF on this Thursday, 12/24 at 6pm! We will have a one hour service ending in a candle lighting ceremony. We look forward to seeing you and your families here as we celebrate the birth of our King! We love you and are praying for you and your family this week!